The Agreement between the Bank of Canada and the Goverment of Canada for the Inflation-Control Target was renewed in 2016. The Bank of Canada has a mandate to keep an inflation-control target range of 1-3% with 2% as being the midpoint target over the medium-run. This target is the year-over-year increase in the total consumer price index (CPI) which is the most relevant cost of living measure for most Canadians. Keeping the inflation target in mind, the Bank of Canada has to maintain a delicate balance given the current state of the economy as well as inflation trending near its target. The low oil prices have taken a snowball effect as it continues to increase unemployment in energy producing provinces while simultaneously causing a weaker Canadian dollar which in turn makes the cost of imported goods more expensive. The BCREA expects a continued weak economic growth for the first quarter. However, with "the possibility of an effective fiscal stimulus, a stronger US economy and a stabilization of oil prices points to stronger growth ahead" (BCREA, 2016). "After standing on the sidelines for years, the Bank unexpectedly cut its benchmark [interest] rate twice last year in an attempt to stimulate a Canadian economy waylaid by low oil prices" (CBC, 2016). Since then, there have been some signs of improvement. 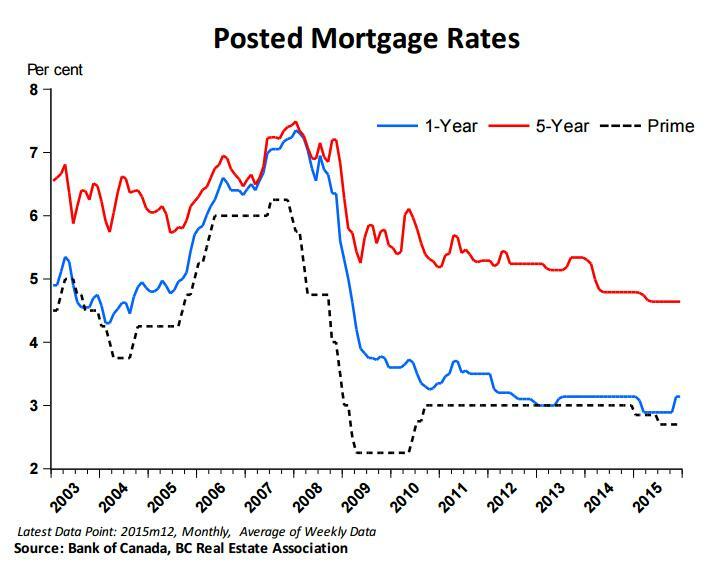 There is potential for the Bank of Canada to reduce rates once more in 2016 although the BCREA's expectation is that the Bank will remain on the sidelines throughout the year. The Bank of Canada has elected to keep its benchmark lending rate at 0.5%. In a broad sense, the Bank will reduce rates when the economy needs to be stimulated or alternatively, would increase rates when it needs to pump the brakes on inflation. Thanks for joining us in this three part series on the Canadian Financial Outlook. For all your real estate needs, contact Amalia Liapis at amalia@wesellvancouver.ca or alternatively, at 604-618-7000. From a macro perspective, Canada's economy is going through a rough patch and growth is slowing down. Several variables contribute to this such as the equity markets being off to a historically bad start, the weak Canadian dollar and the oil prices struggling to find a floor. On the bright side, looking at BC's economy allows us to let out a bit of a sigh of relief. There seems to be a multitude of indicators that provide British Columbians with a glimmer of hope as these indicators point to significant momentum underlying our provincial economy. The pace in which consumer spending and retail sales grew last year was the fastest pace in close to a decade. This key indicator proved to be the largest component of BC's economy. As a result of this, this growth largely reflected markedly improved labour market fundamentals. While employment growth has seen sluggish growth for the past few years, the last six months of 2015 proved to be a stark contrast. Growth was moving at more than a 2% rate over the latter half of the previous year. Full-time employment seeing an increase was the driver spearheading the growth seen. With the growth demonstrated, it is no surprise that British Columbians were in a spending mood. Not only did consumption goods see an increase in sales but larger paychques and confidence in the BC economy resulted in the third highest year on record for provincial home sales. With the relative strength of the economy in BC, it is no wonder why we are seeing more interprovincial migration with workers moving to BC. Since 2013, there has been a net inflow of more than 30,000 people from other provinces, resulting in population growth and adding to an already strong housing and consumer demand. With a strong housing demand comes a record low supply of re-sale and new housing in BC. Developers reacted to this lack of supply by breaking ground on over 30,000 new housing units last year making it the highest number of housing starts since 2008. All in all, BC's economy is forecasted to continue being a growth leader in Canada for this year and the years to come. Want a way to measure home price trends in a chosen area? MLS has designed a tool that does just that. The MLS Home Price Index (HPI) allows users to measure home price trends in the Greater Vancouver region and other major markets in the country. The HPI follows a similar concept to the economic tool called the Consumer Price Index (CPI). With the HPI, it measures inflation or deflation as well as the change in the price of housing features. It "tracks price levels at a point in time relative to price levels in a base (reference) period for one- and two-storey single family homes, townhouse/row units and apartment units". The MLS HPI model is typically utilized to calculate Benchmark Prices. A "benchmark home" is one with similar attributes to those in the surrounding area in which it is located. Relative Benchmark Prices measure the percentage by which the Benchmark Price in a particular area and category is in relation to the overall market at any specific point in time. The tools put out by MLS are there at your disposal and for your convenience. Check out their website here for all these handy tools. For all your real estate needs, contact Amalia Liapis at amalia@wesellvancouver.ca or alternatively, at 604-618-7000. 2015 was the strongest in the past few years with 102,517 MLS residential sales. Economists believe that this year will follow suit with strong consumer demand, however, with a slight 6.2% decline in sales bringing it under the 100k mark to a projected 96,100 units in 2016 and 98,000 units in 2017. 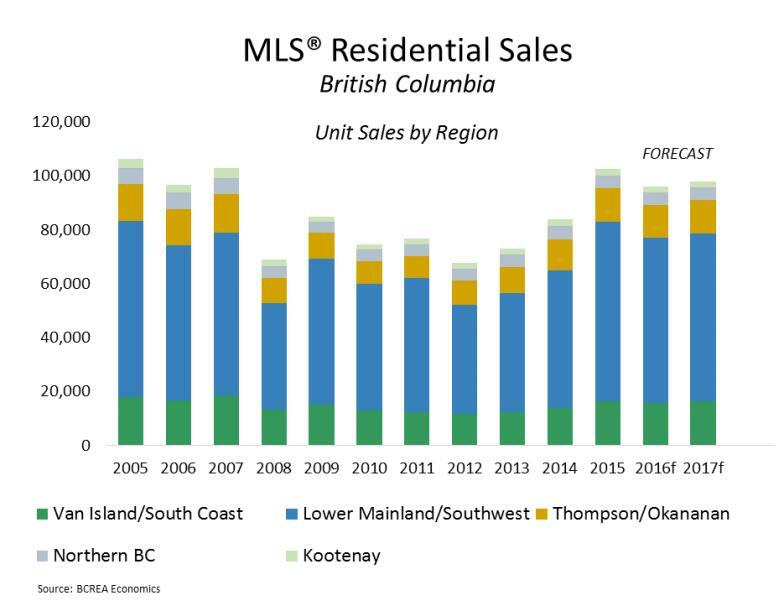 A visual representation of BC's MLS Residential Sales are shown below starting from 2005 to 2017F. BC's relatively robust economy coupled with strong net interprovincial migration has subsequently led to the strong housing demand that we have been seeing. Residential sales over the next two years are projected to remain well above the ten-year average of 83,200 units. In addition to strong housing demand, the average MLS residential price in BC is forecasted at $677,200 (6.4% increase) in 2016 and a further 4.1% to $705,300 in 2017. "The inventory of homes for sale is now at its lowest level in almost a decade," said Cameron Muir, BCREA Chief Economist. "Fewer homes for sale and strong consumer demand are expected to push home prices higher in most BC regions this year and in 2017." In line with the strong housing demand and low inventory levels, new home construction activity is expected to be on the rise to combat the issues of not having enough inventory to supply the high demand. This issue is particularly present on the South Coast. For all your real estate needs, contact Amalia Liapis at amalia@wesellvancouver.ca or alternatively at 604-618-7000. Investment in commercial real estate is a great way to enhance the value of your portfolio. 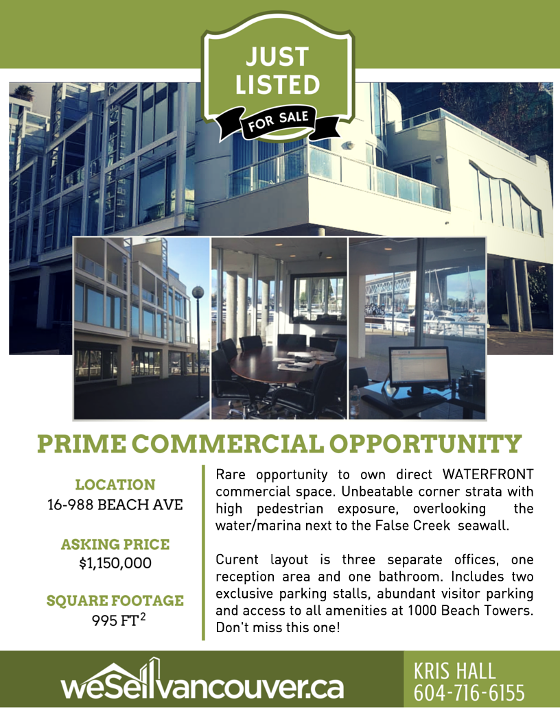 Take a hold of this rare opportunity to OWN waterfront commercial space along Beach Avenue! Contact Kris Hall today at info@wesellvancouver.ca or alternatively at 604-716-6155 for additional information on this listing. EDIT: As of January 14, 2016, the property has been SOLD! With the booming real estate market in Vancouver, it is no doubt that prices have appreciated due to the high demand. What's interesting is the asymmetrical price appreciation seen in the housing market. More expensive properties are seeing prices rise at a faster rate than those of their less expensive counterparts. Price gaps seen between houses, condominiums and detached homes are beginning to widen with Vancouver leading the biggest home price gap increases within Canada. This could be the result of foreign investment activity in Vancouver, especially within the luxury market segment. Housing priced in the higher end of the spectrum are more vulnerable to price adjustments. The asymmetrical price appreciation has been evident in Vancouver for the past ten years which is predominantly caused by the rapid price increase of luxury homes. Housing prices have seen an overall increase, however, luxury home prices are leading the pack with the rate of increase nearly quadrupling the rates of those in the lower end of the spectrum. Homeowners within the move up market are primarily affected by this asymmetry. This phenomenon is limiting the ability for homeowners to "move up" into a bigger home and is even affecting first-time homeowners as well. As a result of the inability to move up, homeowners are beginning to invest more in renovations as it is seen to be a more cost effective measure. Stay tuned for our next blog which tackles the issue of how to renovate your home while remaining on budget. For all your real estate needs, contact Amalia Liapis at amalia@wesellvancouver.ca or alternatively at 604-618-7000. Our last blog took a look at 2014 statistics in the realm of commercial real estate. Today we'll be exploring statistics for 2015 thus far. 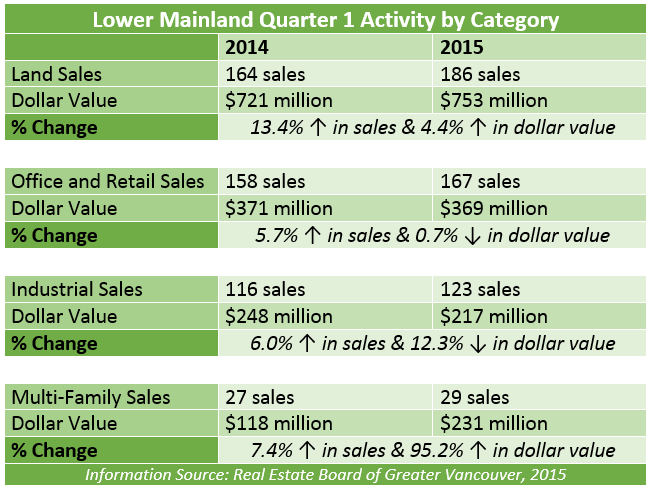 As noted in our last blog, commercial land sales have driven sales activity for the first quarter. It has been an upward trend for the past four years in terms of dollar value in land sales. Below you will find a comparison chart of Quarter 1 commercial real estate activity by category for the years 2014 and 2015. As you can see, the number of sales has seen an increase from 2014 to 2015 whereas the dollar value for each respective category has increased in some categories and decreased in others. Land - Includes properties that are holding properties, farmland, garden centres, redevelopment sites, land assembly sites, vineyards, etc. Office and Retail - These properties are defined by the zoning according to each municipality and must have a building on the site. This includes office, office condo, retail, retail condo, shopping centre, gas station, car dealerships, banks, community centres, daycares, educational facility, institutional, golf courses, movie threatre, hotel, churches, restaurants, truck stops, etc. Industrial - These are defined by the zoning according to each municipality and must have a building on the site. This includes warehouses, warehouse bays and multi-bay warehouses. Multi-Family - These include nursing homes, high rises, low rises and any condo or townhome properties containing four or more units with at least one zoned for commercial use. The Government of Canada has implemented a balanced budget which serves the purpose of supporting a diversified economy and advancing economic growth for the country. Following the 2008/2009 financial crisis, the Canadian government has been steadily moving towards a balanced budget with a $1.4 billion surplus in 2015-2016. Despite the move towards a balanced budget, the Business Council of BC is still preceding with caution due to the slow global growth currently exhibited, the drastically low oil prices and the overall weakness in other commodity markets. The cautious approach for the Canadian economic outlook has subsequently resulted in a significant decline in the nation's overall terms of trade. April 2015 saw a decline in Canadian exports of 0.7% in April and a 2.5% decline in its imports. What Does a Balanced Budget Mean for Canadians? "Current indicators suggest the Canadian economy stalled in the first quarter of 2015, household debt is at an all-time high relative to income, and business investment remains very sluggish," notes Jock Finlayson, Executive Vice President and Chief Policy Officer, Business Council of British Columbia. "For 2015 as a whole, we expect Canada to post relatively feeble real GDP growth of under 2%, with some improvement likely in 2016, provided the US economy continues to gain momentum." As a collective whole, Canadians are united in their definition of home. A recent survey done by Century 21 reveals the top 10 ways Canadians define home which is seen below. The question posed was, "In about five describing words or less, what does "home" mean to you?". The major themes that came up had a lot to do with family, comfort and safety. The personal value of a home is deeply rooted in Canadian culture and the personal definition of home is one that resonates with most Canadians. British Columbians are the only province to include a social aspect to their definition of home by including "friend" in their top 10. The only region to list a practical term, "investment", in their top 10 was Quebec. Lastly, Ontario residents take the cake for being most creative with nearly 90 different definitions of home. Some humorous definitions of home included: escape from people, sweatpants, kitty, no strata fees and awesome. At the end of the day, regardless of where you habituate, home is where the heart is.